Have you outgrown your tattoo? Do you regret having a tattoo and now wish you did not have it? Are you finding that your tattoo no longer represents who you feel you are? Do you now feel self-conscious about your tattoo? Do you now find yourself restricted in what you wear so as to cover your tattoo? Do you no longer go to the beach or the local pool? Paramedical skin camouflage can effectively hide your tattoo for up to 18 hours. 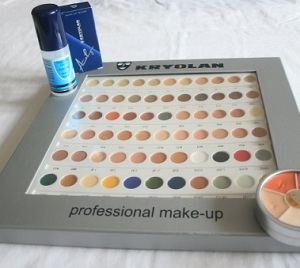 Paramedical skin camouflage is professional camouflage cosmetics. It is waterproof and you can learn how to apply the professional makeup yourself so that you can cover your tattoo whenever you want to. Is your wedding day drawing near and you feel that your tattoo really doesn’t complement your dress? Elaine, founder of Clinique Matrice is a qualified member of the British Association of Skin Camouflage. Elaine will be able to teach you how to carefully apply the various layers of professional cosmetics to cover your now unwanted tattoo. The final layer applied is a special sealing powder. Unlike normal makeup, paramedical skin camouflage will not wear off as the day (or night) goes by. In fact to remove the paramedical cosmetics you need to use a specific brand of gentle cream cleanser. During a consultation with you Elaine will examine your skin tone and recommend the best hypo-allergenic cosmetic camouflage for your particular skin-type and shade. As she specialises in camouflage cosmetics she will be able to tailor make a cosmetic makeup solution for you. There are many great advantages to using paramedical skin camouflage to cover your tattoo. Firstly there is no surgery involved. Surgery too often leaves a very obvious and visible ‘mark’ where your tattoo was. Paramedical skin camouflage is non invasive, there is no pain involved, it’s just like applying your normal makeup, it is a longer process, but it lasts up to eighteen hours and is even waterproof. Can I Hide my Tattoo myself? Using paramedical skin camouflage gives you the option to cover your tattoo when and if you want to. So if you are going to spend a few days lounging around at home you may decide not to apply the professional cosmetics those days. With paramedical skin cosmetics, the skin structure is not altered. Your tattoo however will be camouflaged to blend in with the surrounding skin tone. Take a look at our gallery to see how well a tattoo can be hidden. The camouflage makeup is easy to apply and can make your tattoo virtually invisible by covering the tattoo by using cosmetics to make that area of your skin match in perfectly with the skin surrounding the tattoo. All paramedical skin camouflage products provided by Clinique Matrice are hypo-allergenic and suitable for even very sensitive skin types. Using paramedical skin camouflage is temporary. You can at any time decide that displaying your tattoo is once again something that you wish to do. You simply put the professional cosmetics in the back of the cupboard and you can proudly display your tattoo once again. If you wish to know more about the effectiveness of paramedical skin camouflage in hiding your tattoo, please call Elaine and book a cosmetic camouflage consultation with her – or just have a discussion with her so she can provide you with some advice.